2017 was a rough year for me and seemingly a lot of other people. Here’s a recap of what I got up to. Back in April I made RYGCBMK◯, a project which was weirdly central to a lot of what I got up to this year. Here it is if you want a refresher. I’d wanted to try an abstract short set to music since I went to the Melbourne International Animation Festival in 2015. RYGCBMK◯ was my driver to learn procedural animation with Jacques Lucke’s powerful Animation Nodes system for Blender. I specifically wanted to synchronise abstract animation to a rhythm because I love that kind of synaesthetic stuff and I knew it would keep me going through an emotionally brutal bit of the year. The end result was not perfect, but I got a high enough average score during the voting process for the Suzanne Awards 2017 to encourage me to try some more in the future. The important part was that there was an end result to speak of. It got done. 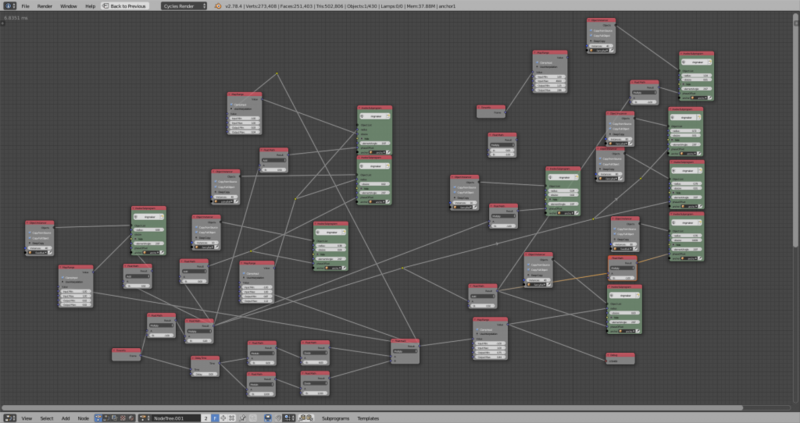 And it got done.. with nodes! Working on RYGCBMK◯ also helped me tune into my artistic sensibilities. Given just shapes and sound to play with, the project took me away from complicated stuff like characters and dialogue to something which let me get a strong feel for the kind of work I want to put into the world. 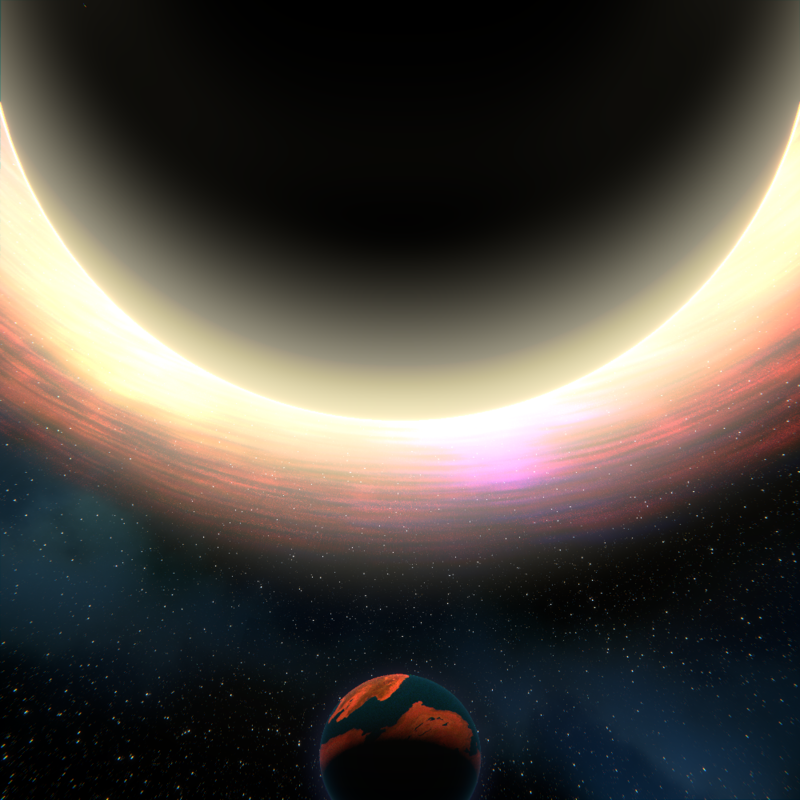 I made important if not voluminous progress with “A moment in the sun” in its third year of development. I put together a new story reel in January and February, and a short stretch of that is good to go as is even with the big rewrite in May. Flipping Pointy from irascible and foolish to geeking-out cute was a decision that very much happened in the wake of RYGCBMK◯ too. There was that secret project I can’t show off yet which happened in October-November. Here’s a concept which we abandoned. The one we actually went with is way cooler. I learnt Retopoflow this year as well – anyone doing modelling in Blender should grab it. Hard Ops is next on my list of useful plugins to get to grips with. There was of course AAAAAAAAAAAAAAAAAAAAAAAA which started strong but fizzled. AMITS now has a sweet cockatoo. Here’s AAAAAAAAAAA’s final resting point. And then there was my first run at Inktober. I started practising with my brush pen and now my inking’s gone from “rubbish” to “slightly-less-rubbish”. This snail got the most likes on Instagram. #inktober #inktober2017 22. Trail. A snail leaves a trail without fail! There wasn’t that much time for art or animation though. RYGCBMK◯’s soundtrack was part of a big jump back into music for me, something I did because I wanted a creative outlet but job stress was (temporarily) making the animation hobby unthinkable. Then it took over. Just over eleven months after I impulse-bought that ARP Odyssey back in January as a shiny new toy to keep myself distracted, I’m now the owner of a 475HP Eurorack modular synthesiser which I mostly soldered together myself. I don’t need to look at a computer screen to make electronic music anymore (though the PC does come in very handy for recording) and the sound is even produced by old-school electronic components instead of simulated versions thereof. In playing around with it I’ve learnt a lot about how to patch and which modules are for what, but no doubt I’ve only just scratched the surface of what this thing can do. To me DASYRAC looks sad and naked and unfulfilled without patch cables, but at least this way you can see the actual modules. This krautrocky jam from early December is one of my favourite tracks I did this year. I didn’t even know how to solder before I started putting DASYRAC together, but I noticed the kit builds were a lot cheaper so I gave it a try. Now I’m actually happier owning synthesiser modules which I put together myself than modules I bought pre-made, because I’m comfortable fixing my own work when it breaks. Most times when I sit down to prod a busted circuit with a multimeter and pore over a circuit schematic, I learn something new and interesting. 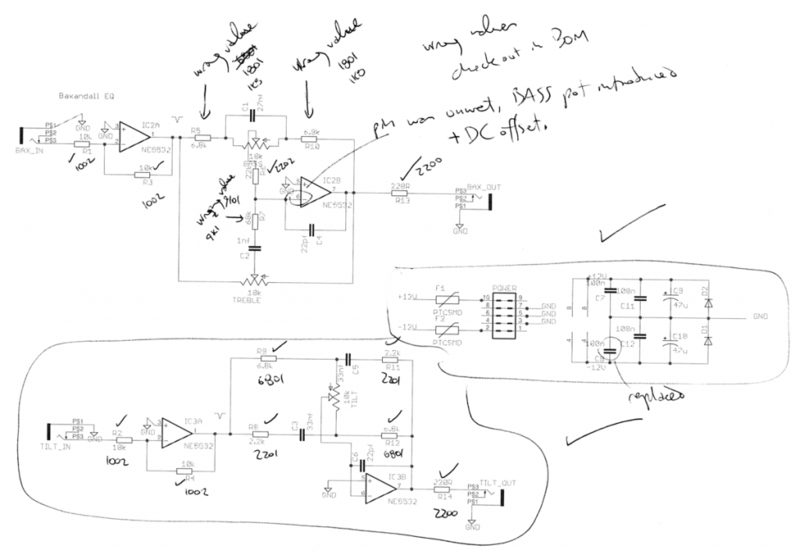 This is the schematic for Music Thing Modular’s Simple EQ with my troubleshooting notes. Looks like I forgot to solder one of the pins on an op amp. So that’s what I learnt and did in 2017. (Mostly synthesiser stuff, to be honest.) This is what I’m taking away from all that for 2018 and beyond. In terms of the modular synthesiser and music stuff, the build is almost complete. Once that’s done it’s all about learning my gear better and maybe getting some tunes released on Bandcamp. 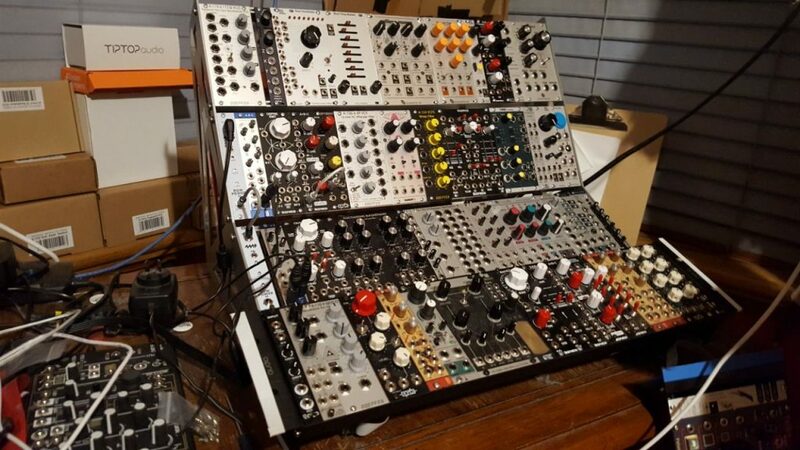 There’s one or two easy modules I want to have a crack at building for myself too, but that’ll need a little bit of extra equipment – it can wait. 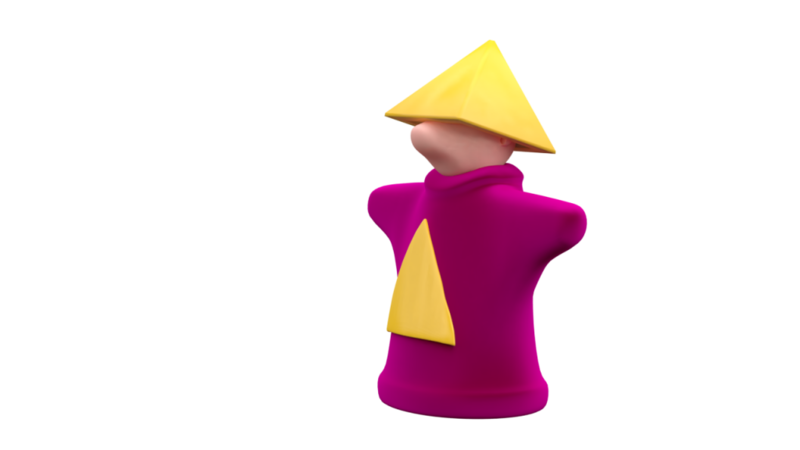 A pyramid monk from AAAAAAAAAAAAAAAA. 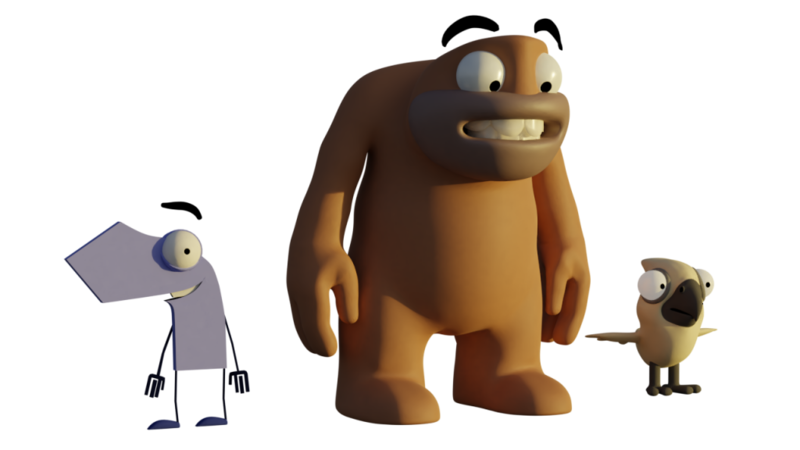 In terms of Blender stuff, I want to jump into some short, focussed and contained exercises – animation, modelling, or otherwise. If it’s animation, I source the soundtrack and character rigs from somewhere else. If it’s modelling, I source a design from somewhere else. I go with pre-made assets wherever possible. The key is not giving myself too broad a set of creative decisions to make at once so that I don’t get lost. By pushing beyond my own creative sphere and not trying to do all the things, it’ll save me time, help me focus on specific tasks, broader my artistic horizons, get me analysing work by other people and build up my confidence and patience again with some experience. With less to do, I can hopefully finish more stuff and get it in front of people to start that all-important feedback loop. As for Gronky and Pointy, I feel like I’ve lived with AMITS long enough that there’s no big surprises left – just a lot to execute on. If I can stay organised and find a good chunk of time every week to work on it (five hours a week minimum is a good pace), it’ll get done. It’ll probably be not the best, but at least it’ll be finished. The day job may have other things to say about all of this, especially if I score the promotion I’ve been working towards and people keep departing, but we’ll see. Happy New Year for 2018, and I hope the coming year treats you all well!